In our latest Flashback Friday installment, we look at one of our favorite hikes in the Tri-Cities area: the Twin Sisters. On a sunny day, the Columbia River looks spectacular from the Twin Sisters. The river runs through a wide valley in the Tri-Cities before passing through Wallula Gap and then going into a gorge type setting. If you’ve been to the area, it’s hard to imagine this exists nearby. The Tri-Cities doesn’t offer a lot in the way of hiking, other than Badger Mountain. So when we discovered the Twin Sisters, we were more than delighted. The short hike with an amazing view became our go-to hike whenever people came to visit. 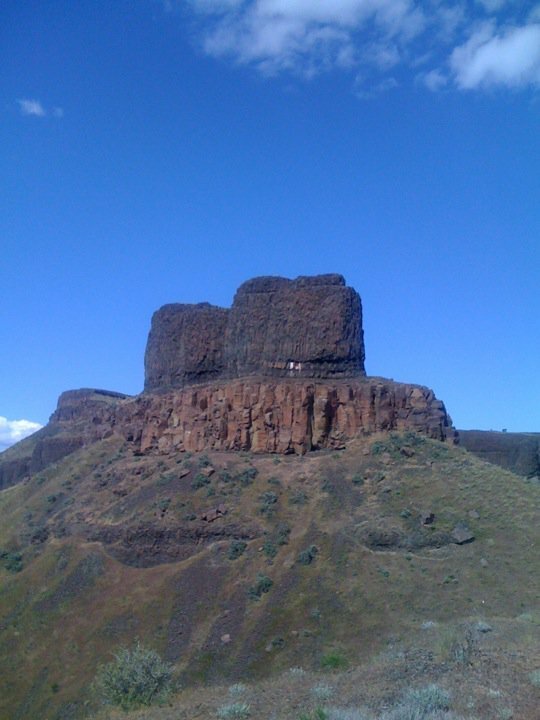 The pair of basalt rocks sit high above Highway 730, just south of the junction with Highway 12 and 20 miles south of Pasco. 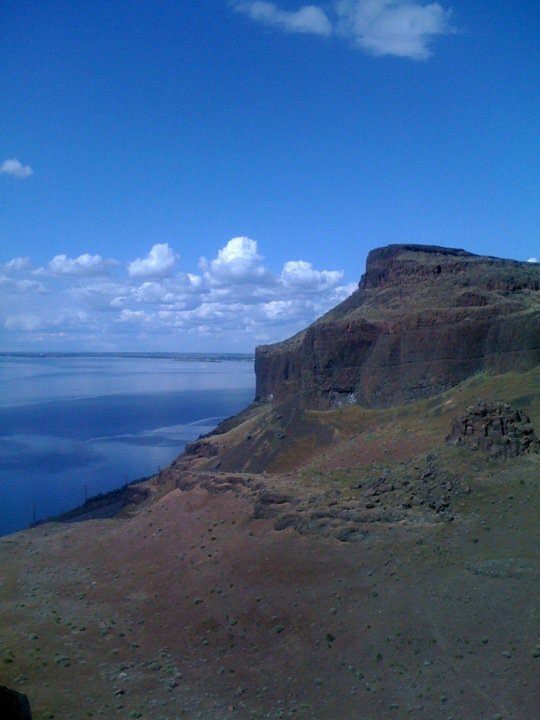 While it isn’t a long hike (about a mile or so), it is steep and the views of the Wallula Gap are stunning. To top it off, no one seems to know about it. We hiked it at least five times in the four years we lived there and very rarely had company. On sunny days, the view down the Walulla Gap are tremendous. The rocks cast a giant shadow which is welcome in the Eastern Washington heat. The two pillars were formed during the Missoula Ice Age Floods, which eroded the Columbia River basalt lavas, forming the two towers high above the Columbia River. The Twin Sisters from the other high point in the park, a vista just south. The legend sometimes replaces the coyote with a wolf. 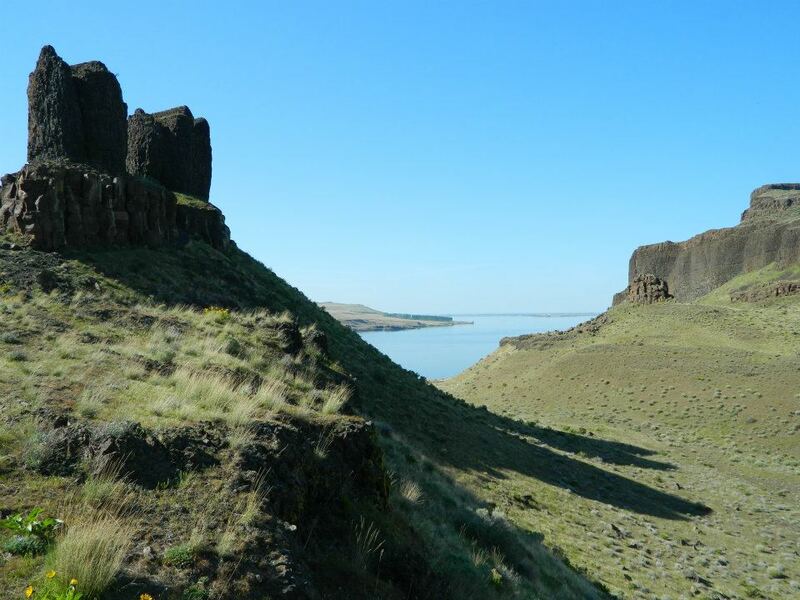 Also, Lewis and Clark wrote about the Wallula Gap, but made no mention of the Twin Sisters. During one of our hikes up to the top we brought a picnic lunch and enjoyed our meal with this amazing view. 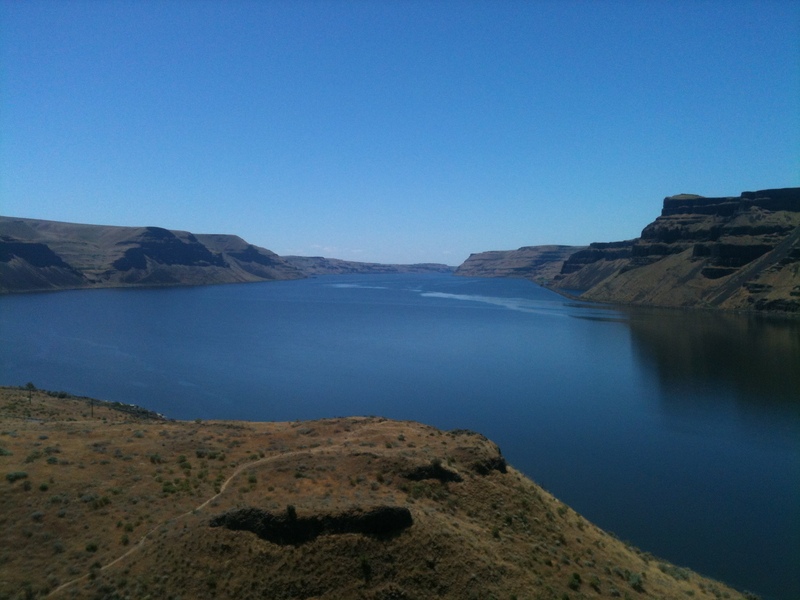 The gap, located just south of the confluence of the Walla Walla and Columbia Rivers, is recognized as a National Natural Landmark by the National Park Service. 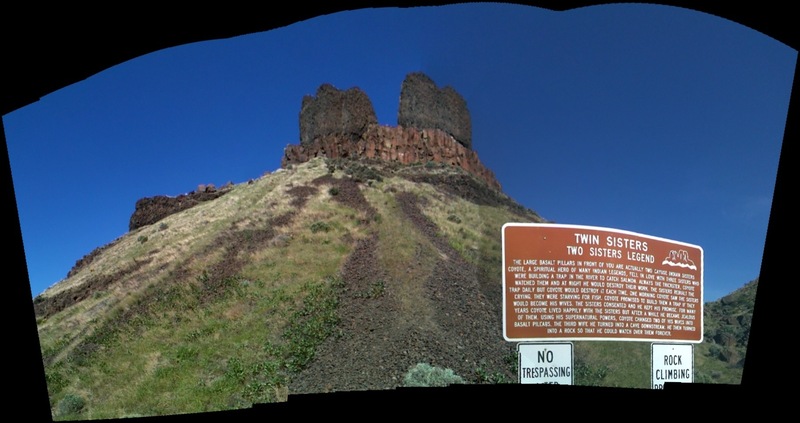 An iPhone panorama of the Wallula Gap shot from between the two sisters. Some of my favorite moments while sitting between the Twin Sisters were when there was no traffic on the highway and a freight train would be chugging along across the Columbia River: Just a peaceful setting. It would kind of send you back to what it must have been like in the 1900s. Of course, then the screeching of a semi-truck’s brakes would bring you back to reality. Looking downstream from between the two sisters. 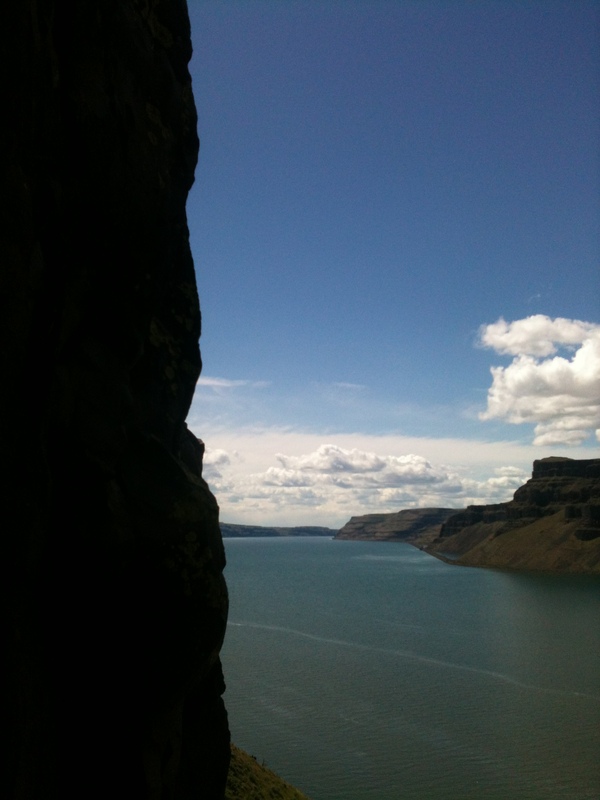 The views from about 500 feet above the Columbia River are awe-inspiring. After you hike up to the top, and explore the paths winding around the base of the rocks, you can also hike to the back fence line and enjoy the interesting geology in the area, notably the sand dunes which seem a bit out of place. Do not cross the fence, as it is private property and there have been reports from other hikers of a landowner aiming guns at trespassers. Looking north back toward the Tri-Cities from the north sister. The park extends to the vista across the small valley, and you can climb the hill to the rock base. This would be our last summer hiking as just a family of two. Well three if you count Molly. Also, be on the lookout for snakes during the warm summer months. The entrance to the trail from the parking lot also requires climbing a ladder over a barb-wired fence. 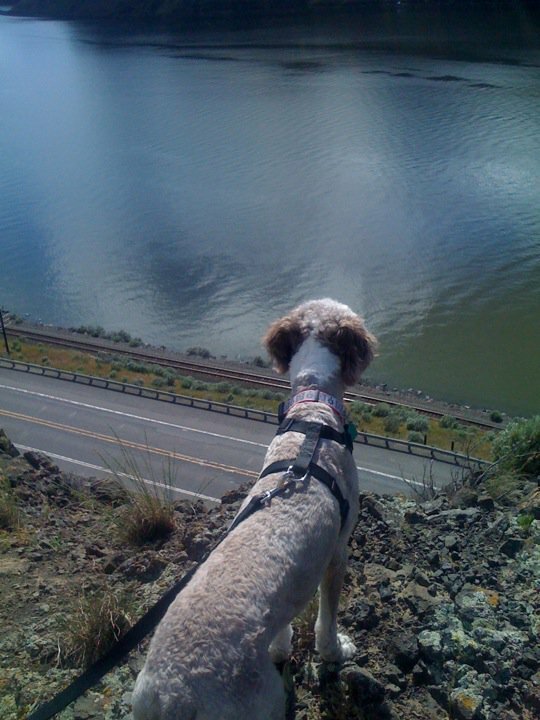 Ms. Molly enjoying the view and wondering how hard it would be to leap down the mountain to get at the birds below. If you ever find yourself in the Tri-Cities or Walla Walla, make sure and swing by the Twin Sisters. It is well worth it. Location: 20 miles south of Pasco on Highway 730, just south of the intersection with Highway 12. When: Any time of year is fine, but the water is at its sparkling best on a hot summer day. 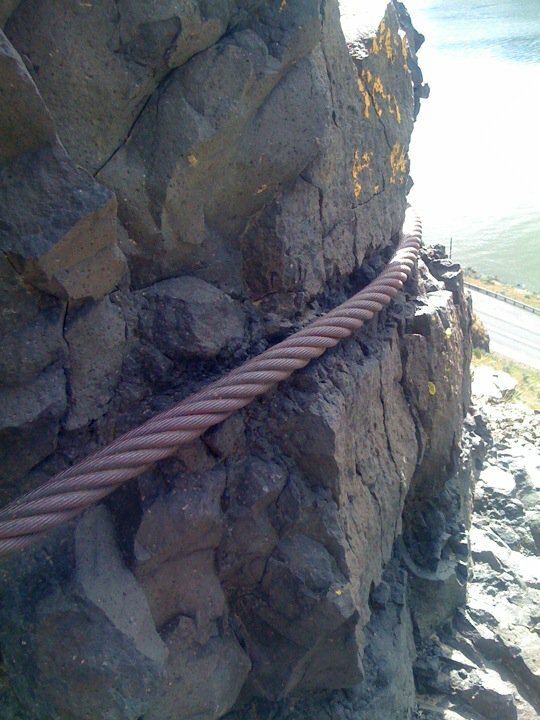 What: Pair of basalt rocks jutting out high above the Columbia River. 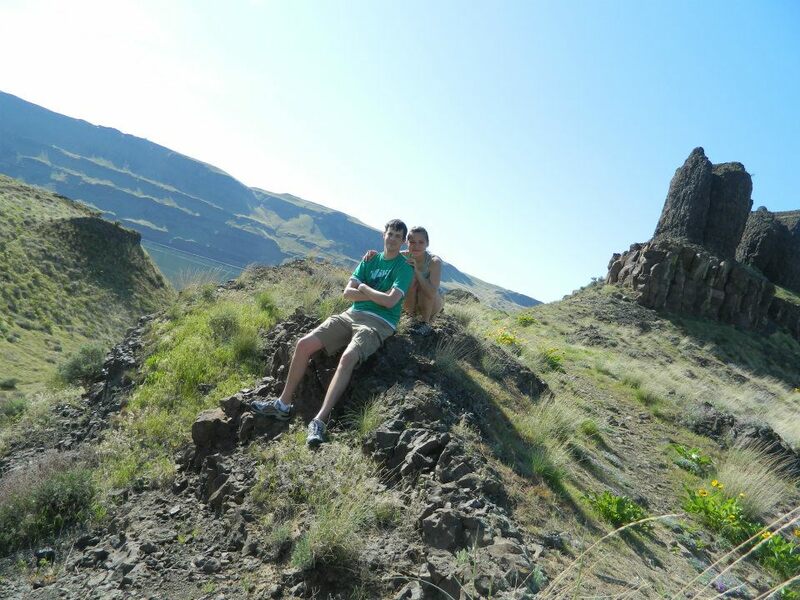 A short, but steep hike allows you a tremendous vantage point of the river and the Wallula Gap. Kid-friendly: Not really for kids under-10. Extremely high drop-offs, and the path goes up loose rock and is dangerous for all ages. This giant cable surrounds the north sister and is a bit freaky, as it appears to serve no purpose. I assume it has something to do with rock climbing, but I could never figure it out. It reminds me of the TV show LOST – maybe Benjamin Linus will pop out and explain everything. Looks like a great place to visit. Beautiful photos. Thanks! It really is a nice view. Thank you! It really is an awesome view.